Great under putting greens and adds comfort to outdoor patios. Helps with moisture mitigation on roof tops. Description - Tired of watching all your hard work die in the winter? Maybe, you are in a place where water is scarce. Never have a brown yard ever again with our Always Summer Premium Turf Rolls. Great for any part of the country, these fake grass rolls will make you feel like it is summer time all year long. Easy to clean and maintain, these artificial grass rolls will not only lower your water bill, but will also help to preserve water for future generations. Always Summer Premium Turf Rolls are made in the USA and are backed by 10-year warranty. Face Weight – 36 oz. Weight – .41 Lbs. per square feet. Recommended Uses – Always Summer Premium Turf Rolls are the perfect alternative to natural grass in your front yard or backyard. 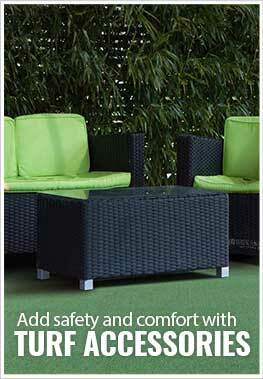 Easy to clean and maintain, these fake grass rolls can be installed anywhere in the country. Great for any part of the country. The spring green is such a great color and my pug LOVES her little grass area. She thinks it's real and I'm okay with that.